So Saint Patrick's day has come and gone, but the green beer and the partying is not over yet! 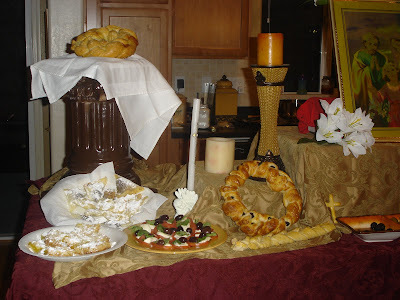 Well, maybe the green beer is over (that is just NOT appealing to me) but Italians will party on this Saturday with La Festa Di San Giuseppe - The Feast of St. Joseph! The Irish may make their claim on Saint Pat (who wasn't even from Ireland!! ), but Italy's love for St. Joseph dates way back to Sicilia, the home of my paternal grandfather. Long ago, during famine in Sicily, the people prayed to Saint Joesph to end the drought and hunger that plagued their people. They promised to honor him with a great feast if he came through. Well good old Saint Joseph (patron of Sicily, fathers, and carpenters) took care of his paesans, and the people of Sicily kept their word! The Sicilians honored him with a grand feast in his name. They bult an altar (usually consisting of three tiers for the Blessed Trinity) caleld the Tavolo Di San Giusppe, or the Saint Joseph's Table. Since his feast day falls during Lent, much of the food was meatless, consisting of authentic recipes of the region. Basically, they cooked what grew in their area, like fava beans and artichokes. There was always a ton of homemade bread, often shaped into symbolic crosses, shepherd's staffs, or carpenters tools. 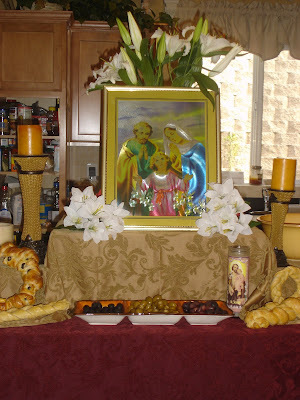 And the altar is gloriously decorated with pictures of St. Joseph and, of course, lilies (a symbol of his purity). Our first Saint Joseph's table was a hit with my kids! family would enjoy, including stuffed artichokes, pasta with vegetable sauce (recipe coming soon), fried wonton skins stuffed with nutella and mascarpone cheese, and, of course, bread! We braided some loaves, and the kids shaped their dough into little hammers and candy-cane-shaped shepherd staffs. We decorated the table with our finest linens. It was a feast to remember. This year we'll conquer it again, thanking St. Joseph for our family's blessings, just as our ancestors did. 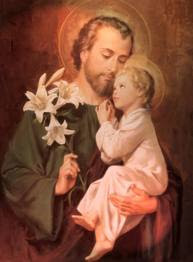 (St. Joseph is a special friend to our famiglia!) Here's one of the traditional recipes we'll be trying for the first time - a zeppole-like pastry or cream puff that is often served this time of year. The following recipe uses cream puffs mix. You could also buy the cream puff shells from your frozen section. Cream the cheese and blend thoroughly with other ingredients. After the shells are filled, dust with confectioners sugar. You could always top each shell with a spoonful of chocolate icing and sprinkle with slivered almonds, or slender strips of candied orange peel. They are also often decorated with sweet vanilla butter cream icing and a cherry on top. I'll let you know how it works out! Buona Festa di San Giuseppe! This is a very odd question. My father is Croatian and my mother is Irish. He likes to stake the claim to St. Patrick and she ignores him. I've tried to find information on St. Patrick linking him back to The Mediterranean and was wondering if you knew where to find it so this discussion can be put to bed.